All Australian research institutions that receive NHMRC or ARC research funding or otherwise operate under the auspices of Universities Australia should be steadily working toward implementing the 2018 version of the Australian Code for the Responsible Conduct of Researchby 30 June 2019. We’d argue that all other Australian research institutions should also be working on implementation. As you will have seen from the countdown on the AHRECS website, we’re down to the last 50% of the time to implement the Australian Code (2018). We understand that in many institutions research staff and management are stretched and that the recent cuts in research infrastructure funding will do little to help that. We are not trying to provoke panic or undue stress, but believe that a commitment to research integrity (like research ethics) involves long-term, consistent and coherent planning and investment and not erratic and unsustained bursts of ‘excitement’. Those institutions that are still struggling with the 2007 Code should see that as an indication that they need to take the 2018 Code seriously and not hope that its demands will go away. Awareness-raising and professional development are effective ways to implement the Australian Code (2018) and invest in the research culture of an institution. To assist our patrons, we’ve come up with a cost-effective resource. A template for a workshop for HDR candidates and other early career researchers (to be delivered by a member of your staff) about the Australian Code (2018) and research integrity in general. 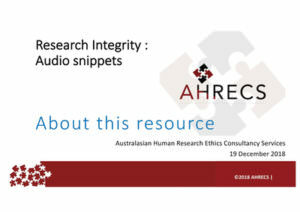 Over 40 audio clips by Dr Mark Israel that can either played within the above workshop or placed on a resource page for access by your research community. A group activity sheet of nine vignettes, that are based on real cases. (1) and (3) are supplied with facilitator notes. Included with this post is a sheet that suggests which audio clips to use with each slide of the ppt. The sheet is included with the resources discussed in this post. 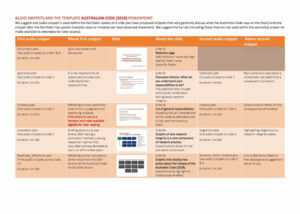 Also included here is a PowerPoint with an embedded audio clip about the resource. It only costs USD15/month to become a Gold Patron. Visit https://www.patreon.com/ahrecs to become a patron and for more information. Of course, AHRECS would be delighted to run such workshops for and with you and to support the development of policy and procedures in your institution that would meet the requirements of the 2018 Australian Code. See https://ahrecs.com/australiancode2018 for further information about the ways AHRECS can assist you with implementation.